Working large is very enjoyable. To do a mandala this size I find I have to keep rotating the canvas. It really helps to get the relaxation going to make the same stroke over and over. It is fun to see the design develop. Alphabee Tangles will focus on pen drawings that use patterns to create images. This style of art brings me great satisfaction in the creative process and in the finished piece. A recent term - Zentangle ® - provides a modern label to this artform. 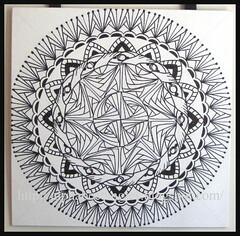 I am pleased to have had workshops with Rick & Maria, the owners of the trademark for 'Zentangle.' Their energy has really ignited this form of art. I am not a CZT but I do create what would be labeled ZIAs and am happy to share my experience with others. If you wish to see Calligraphy, please visit my original blog @ longvillagelettering.blogspot.com - there I will keep the focus on lettering for weddings and calligraphic artwork. I welcome you to follow both blogs! This is a Flickr badge showing public photos and videos from long village lettering. Make your own badge here.